A Montgomery County speed camera issued a citation to a vehicle traveling 34mph in a 35mph zone, with photos showing two different cars in the two images. The incident was first reported to the Maryland Drivers Alliance by the recipient of the faulty citation, who did not want his last name used. The citation was dated May 27, 2013 on the 9000 block of Georgia Avenue N/B. The first photo, taken at 5/27/13 at 9:37:29am, depicts the ticket recipient's car: a blue Toyota traveling 34mph. The second image taken at 10:01:39am (a 24 minute time difference), depicts a black dodge, with a speed of 53mph imprinted on the image data bar. The motorist had written to the county asking it be dismissed, and was sent a date for a court hearing for September. The Maryland Drivers Alliance, with the motorist's permission, forwarded the information to Montgomery County police and requested the citation be voided. The county agreed that the citation was in error and sent the driver a void letter including an apology. Montgomery County stated to WTOP TicketBuster that the citation was reviewed twice before being issued, but admitted that neither of the two reviewers examined the images closely enough and will receive additional training. "A technician took a test shot and mismatched it with an actual speeding violation, thus creating the possibility of having two different vehicles in one citation. Both the civilian pre-approver and the officer failed to capture this", he said. 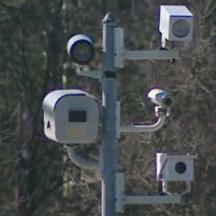 According to the investigation, an error caused the Georgia Avenue camera to go offline on May 27. 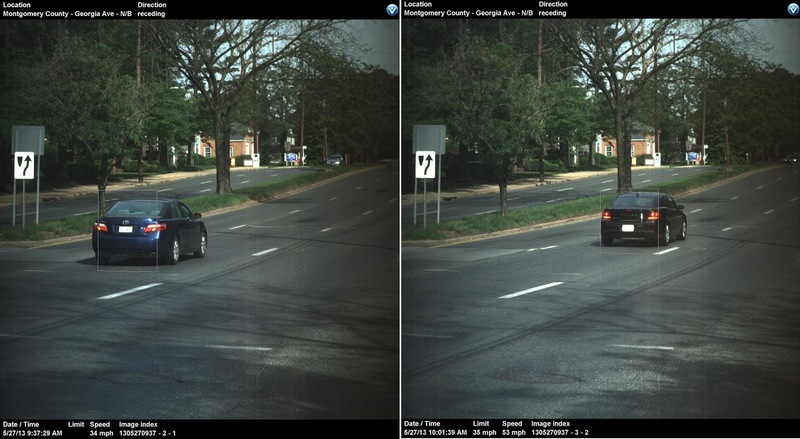 A Xerox technician restarted the camera, then accidentally attached the test shot at 9:37 a.m. with the first violation afterward at 10:01 a.m. "
Montgomery County manages the program under contract with speed camera contractor Xerox Corporation, who is paid $16.25 for each fully paid citation. The county avoids a provision in state law which says "If a contractor operates a speed monitoring system on behalf of a local jurisdiction, the contractor’s fee may not be contingent on the number of citations issued or paid." by asserting that the county, not Xerox, "operates" the cameras. Although this conflicts with the meaning of the law as described by some state lawmakers and Governor O'Malley, courts have so far given speed camera programs a free pass on semantic games such as this. Under state law requires speed cameras to be calibrated annually by an 'independent calibration laboratory" and states:"
(ii) Shall be kept on file;"
On 6/24, we requested copies of the annual calibration certificates and daily setup logs for this device from the county under the Public Information Act. On July 2 we repeated the request and specifically asked for the contact info for the "custodian of record" for the logs. We repeated the request again on 7/3, referring the county to the portion of the Attorney General Manual on the MPIA which requires "immediate" access to public records when they are of a sort which are readily available, and asked again for either the logs or the custodian's information. At that time we emphasized that ticket recipients have only limited amount of time to either pay or contest a citation and that they were day by day losing their right to dispute the tickets if the logs provided grounds. The county's response was that we should "be patient" and "I anticipate you will receive a response by the end of the day". We did not receive the logs by 7/7, so on 7/8 we repeated our request for the logs again. This time they were received, but too late to be of significance to citation recipients who have already paid. 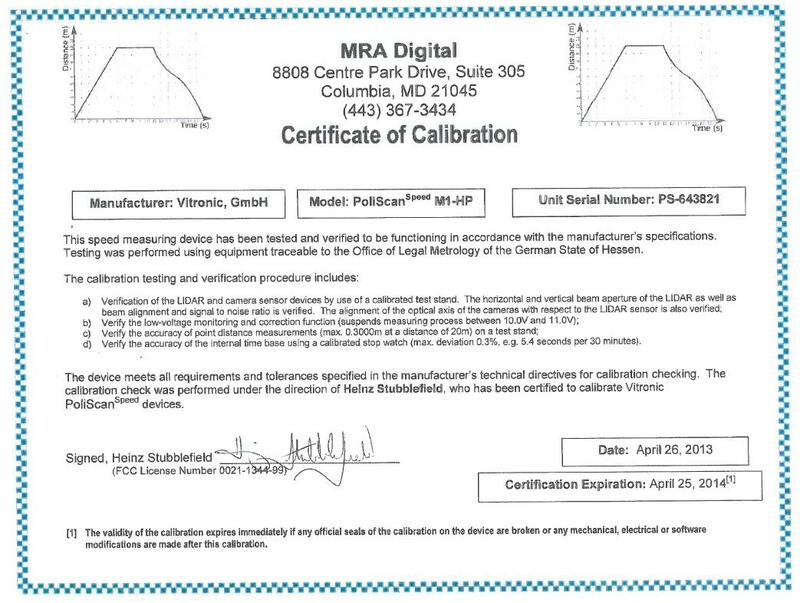 The device is a 'Vitronic Polyscan', similar to those used by the SHA's "SafeZones" program. The daily setup logs show the name of the 'Operator', and show the start and end times for the deployment(5/27/2013 at 9:37-5/28 at 9:32). The log gives no indication of any "error" causing a shutdown, nor do they record the reported activity by Xerox Corporation. There is a check-box which says "System Self Test Result", however it does not include a specific statement that the test was "performed " by the operator, nor is there any statement affirming what the "operator" personally did or swearing to anything in particular, such as the statements which used to appear on older logs. The specific items/checklist which the "operator" performed are also not shown in this log, even though such information was normally included on older format logs from Montgomery County. 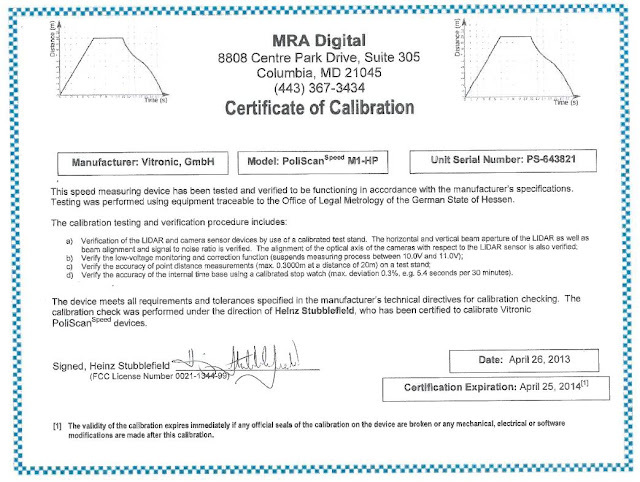 The annual calibration certificates were issued by the same company, and "signed" by the same individual, who "certified" speed cameras used by Baltimore City in 2013 which passed all calibration tests but still systematically issued erroneous tickets. We asked Captain Didone the question: "If the nature of the citizen's complaint was instead that the speed reading was incorrect, despite the calibration tests passing -- which is exactly what transpired with Xerox's speed cameras in Baltimore City -- how would you be able to determine that?" His response was that Baltimore's problems were due to placing cameras where there was "cross traffic" and "not properly training their officers on radar effects", and that "Neither of those situations are present here in Montgomery County"..."Regarding people questioning speed, currently, when the actual speed is challenged we currently review all aspects of the approval process, the logs and take an additional look in the photo for possible radar effects. If nothing improper is detected, the citation will be sent to court. " wrote Didone. We then asked whether we could see the documentation and training materials on how to identify "radar effects", the county provided no documentation, instead a county representative stated in a letter that "The speed monitoring system responsible for citation number [....] was a 'Lidar', laser based system and is not subject to radar effects." During the 2013 General Assembly, Captain Didone lobbied the state legislature on behalf of Montgomery County against a bill which would have require citations to contain enough information to verify speed from recorded images. 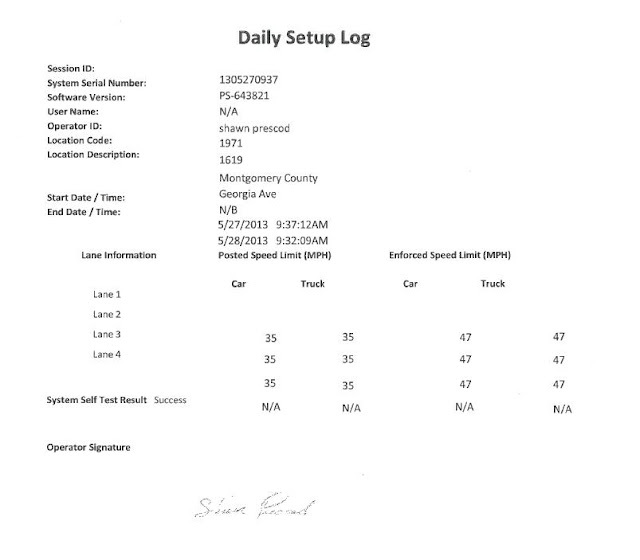 Speed cameras like the LIDAR camera issuing this particular erroneous citation have timestamps rounded off to the nearest second, making it impossible to independently verify vehicle speed from the images and time interval (as was done by us and by the Baltimore Sun to prove systematic errors in Baltimore City last year, resulting in the exoneration of hundreds of falsely accused Baltimore area motorists). Montgomery County Police have stated that motorists who receive erroneous citations can "send an email to the speed camera Mailbox or call our main number 240-773-6050 and speak to our customer service person". Those who do not wish to have such events "swept under the rug" and would rather help ensure the transparency and integrity of the system can instead use the Maryland Drivers Alliance Contact Form.